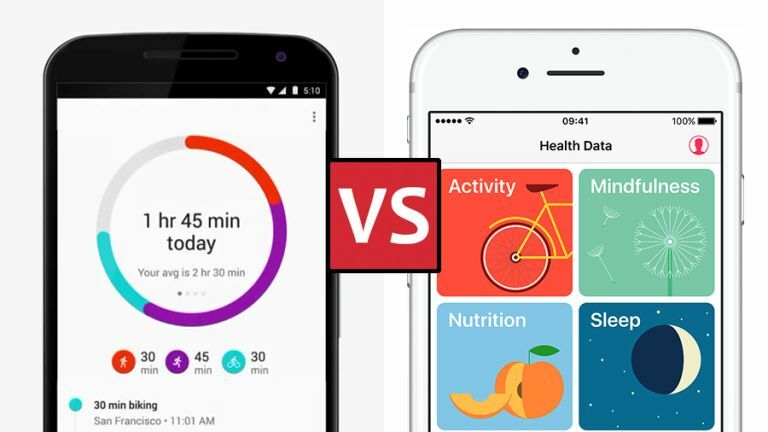 Apple and Google like to battle it out in pretty much every tech category available - from smartphones to email - so it's no surprise that they both have their own health and fitness tracking platforms and apps, now arriving as standard on new Android and iOS devices. Fit and Health were announced within months of each other in 2014 and both are designed to track your activities and get you healthier - but which is worthy of your precious personal data? Or doesn't it matter which one you use? We take a closer look. At first glance there's not much to choose between Apple Health and Google Fit. They both have apps that live on your phone, and they both track your walking, running and various other types of activity through the motion sensors built into whatever handset you've got. Both are free to use, work with a variety of third-party apps and devices, and are compatible with certain smartwatches (Android Wear for Google Fit, and the Apple Watch for Apple Health, naturally). Dig a little deeper though, and you'll notice Apple Health is a much more comprehensive app: it's got designs on the whole of your medical information, not just whether or not you're moving enough during the course of the day. Dive into the menus and there are options for blood glucose level, the amount of caffeine you take, and so on (your phone can't measure all this but it can tap into apps that do). Google Fit has its own advantages - it's available on the web, for example, unlike Apple Health, so you can check up on your statistics from any connected computer. Google Fit vs Apple Health: what gets tracked? Both Google Fit and Apple Health track the very basics: the steps you've taken, the distance you've covered, the calories you've burned. A lot of this data can be logged automatically, as long as you keep your smartphone with you at all times. Other data - like sleep, which both platforms can handle - needs to be fed from a third-party app or device. Google Fit is very focused on activity, and as well as walking and running you can add dozens of other activities to your record, from beach volleyball to paragliding. Many of these types of exercise need to be logged manually, but the options are there. Apple Health is more straightforward as far as logging exercise goes, covering the main options like cycling, swimming and workouts as well as walks and runs. As we've mentioned though, Apple Health goes into a lot more depth in terms of general medical data - you can store your whole health history in Apple Health if you want to. Both Apple Health and Google Fit can store certain types of fitness data automatically on your phone, but for some sorts of activity and medical data they need help from other devices and apps. It's hard to get a definitive list of apps and devices compatible with either Google Fit or Apple Health at the moment, but Apple Health appears to have the edge in terms of the total number of compatible apps - it works with trackers from Misfit and Withings, as well as big-name apps like Runtastic, MapMyRun and Strava. Google Fit can also import data from Runtastic, MapMyRun and Strava, plus Withings devices. It doesn't support Misfit trackers, though of course you can also pick from the many Android Wear devices on the market, all of which work with Google Fit. Currently the big hold-out from both Apple Health and Google Fit is Fitbit, the most successful fitness wearable seller of the moment - if you've got a fitness tracker then it's most likely to be a Fitbit one, but for the time being you can't pipe your data into either Google Fit or Apple Health. With both these services tied so closely to the OSes they run on, it seems pointless to declare one better than the other - you've made your choice of smartphone, and you're pretty much stuck with whatever's on offer. That said, it might help you make an Android vs iOS decision in the future, and it's always worth keeping tabs on how these two mobile platforms are stacking up against each other. Apple Health is undoubtedly the more comprehensive and has a few more apps and devices that are compatible too. Google Fit, meanwhile, is a bit more basic which may or may not be what you're looking for - we like the fact you can get at it on the web as well as on your phone. Ultimately if you've bought yourself a Fitbit tracker you'll find the apps and ecosystem that come along with it are better than anything Google and Apple have done so far. In fact whatever type of tracker you've bought - unless it's an Apple Watch or Android Wear watch - you're probably better off sticking with the supplied app. That said, if you don't have any wearables and just want to track basic health stats with your phone as you walk and jog around, both Google Fit and Apple Health do a decent job. We'll be interested to see how they grow and evolve over the coming years.